Another season of exciting track racing is set to begin again in Calgary on Thursday, April 26. We'll have new Thursday night race schedules this season and are adding five Saturday race events - one sprint day, two UCI omniums and two points race days. 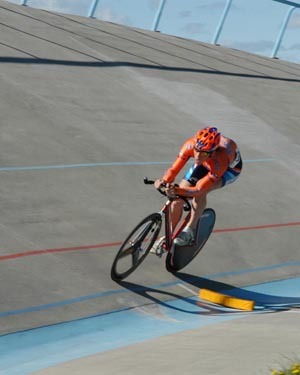 Registration takes place at the Glenmore Velodrome at, 5300 19 St. SW on Thursday, April 19 from 6:30-8:30 PM and on Sunday, April 22 from 1:00-3:00 PM. Use of the track in CBTL training times and racing for the whole season costs $80, $50 for juniors. Rental bikes are also available for $100 for the season. Novice training courses, which are required for all newcomers, start on April 24.